While IT understandably underpins council services, why does it sometimes feel like the tail is wagging the dog when it comes to IT helping to actually deliver those same services? For instance, a council cabinet member recently shared with Quadnet how she had presided over an unfortunate period where her child protection systems were all but unusable, while her colleagues in IT paid only lip-service to her frustrations. She painted a vivid picture of staff creating their own, local and unconnected spreadsheets as the official computer programs could not be relied upon to be available and speedy and robust for the inputting and sharing of important data. With joined-up insights being lost in the process, she could see that the children she was trying to serve were being put at increasing risk, while the council itself was in danger of breaching its compliance requirements. In Quadnet’s experience, this service head is not alone - councils around the whole of UK have services whose productivity is being compromised by slow computer applications. Sometimes a constituency is merely inconvenienced (and the council’s reputation eroded a little), but sometimes, for example with revenue and benefits systems, slowness in IT systems causes real hardship, if not misery. So if IT is so important, why are so many leadership and service heads so unable to better manage IT? Is IT really still 'a black art', as one finance director said to me? This next section is for you, if your IT department appears to enjoy confusing you with techno-babble rather than working with you to improve business efficiency. Many revenue & benefits departments are rightly measured on claim ‘turnaround time’ – after all it would be odd to measure them on the number of ‘cheques issued’, for example, when their purpose is to help the vulnerable at their time of need get the assistance that they require to be housed. Yet typical measures for an IT department are server and network ‘availability’, help-desk tickets marked ‘closed’ and projects implemented ‘within budget’. Rarely, if ever, is efficiency being used as a measure. Yet often it could be. When a revenue & benefits system runs slowly, not only do officers get frustrated, but it impacts negatively on claim turnaround time, a key performance measure of their department. Yet if the IT department is challenged, they tend to respond in the language of ‘networks’, ‘servers’ and maybe ‘computer code’ - important yes, but not the whole story where productivity is concerned. So hold the IT department accountable for the speed of an application, and remove the techno babble with a simple measurement. 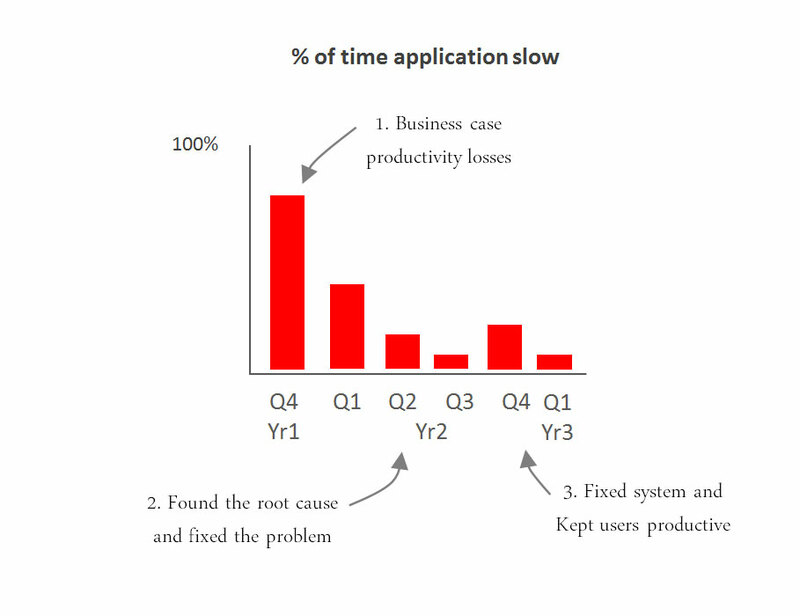 The chart below shows a simple method for driving change over a few months, by measuring the speed of an application or program, and so enabling it to be managed. Often when systems are not working or are slow, telephone a helpdesk doesn’t really help very much. 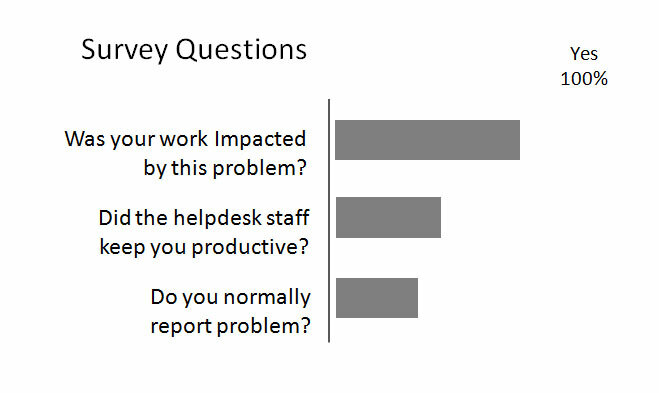 Helpdesk staff, under the direction of their managers, seem to be interested in closing calls rather than getting you back up and productive again. This is because they are normally process rather than productivity-led. Often when you buy systems they are touted as ‘efficiency improvers’ – so get some evidence. Why not undertake a pilot study, in order to see just how much efficiency will be gained in a process and department, extrapolate the finding and only then look at whether the cost of implementation seems justifiable. Now just measuring these three things is not enough on their own; you now have to hold the delivery people accountable for what the results show, and this sometimes requires change if not a little confrontation too. So if your IT department is not supporting you in the right way, arm yourself with the knowledge to solve the problem. Let's face it, 'IT' is not going away - so we might as well learn how to manage it, and in doing so have a less stressed, more productive environment that better serves constituents.